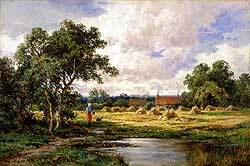 Parker's style shows a great influence by the Impressionists, through his use of bright colors and quick brush strokes, but a definite understanding of the Academic principles is also displayed. 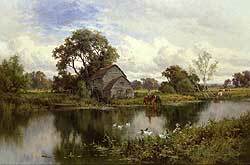 This style of painting was very typical for the late Victorian landscape artists who strove to incorporate the new Impressionist techniques in their more traditional paintings. 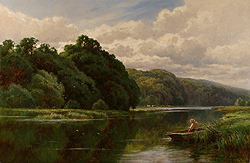 His landscapes and skies were created with a free, but controlled, application of paint while the watery areas of his work were handled in the more traditional way - using glazes to create depth and reflections. 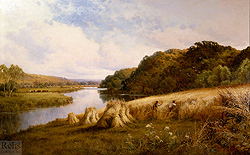 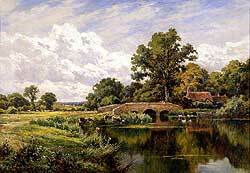 The paintings are well composed, beautifully balanced and capture the landscape in its most pure and natural state. 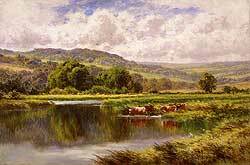 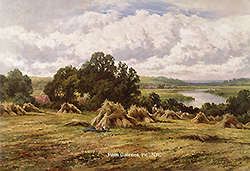 This colorful and free look was a welcome relief to the traditional Victorian landscapes of the previous decades and this, coupled with Parker's choice of subject matter, brought him great success. 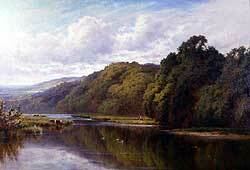 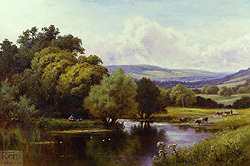 His favorite locales were in Surrey, Kent and Wales - especially views on the Thames – and he would often sign and title his works, with their exact location, on the reverse. 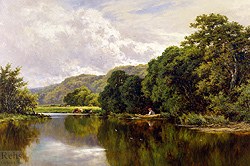 While there are not definite records to prove this, his work shows great similarity in both technique and subject matter to that of Benjamin Williams Leader (1831-1923); if he was not a student of Leader’s, he definitely studies his works. 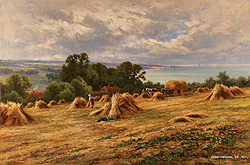 It is interesting to note that Parker was one of only a handful of important Victorian artists who never exhibited at the major exhibition halls in England during their lifetime.